Much like how hungry foodies can place orders quickly through mobile apps, aspiring restaurateurs can now also buy ready-to-launch food concepts, including a well-designed dining place to boot, that can be up and running in just 90 days or three months. That’s what local startup Revolution Pop promises would-be entrepreneurs in the food industry using what it calls “modular precrafted and custom-designed pop-up food outlets” called BLOX. Clients may choose from a variety of pre-made restaurant concepts, which come equipped with their own menus and structure designs. The startup is a venture between some of the country’s youngest, most ambitious and most innovative entrepreneurs, including Robbie Antonio, whose Revolution Precrafted is considered the Philippines’ first-ever unicorn or startup with a valuation of at least $1 billion, Dennis Uy of Phoenix Petroleum and Chelsea Logistics, and Jack Tuason, one of the founders of Enderun Colleges, the country’s leading culinary and hospitality management school. Revolution Pop promises that even entrepreneurs without any culinary background or even a food concept can start running a restaurant in three months’ time. BLOX buyers will be provided with well-researched restaurant concepts, customized with the aspiring restaurateur’s vision. “The world is filled with great ideas that are never pursued, and we’d like to evolve these ideas into reality,” said Tuason in a statement. 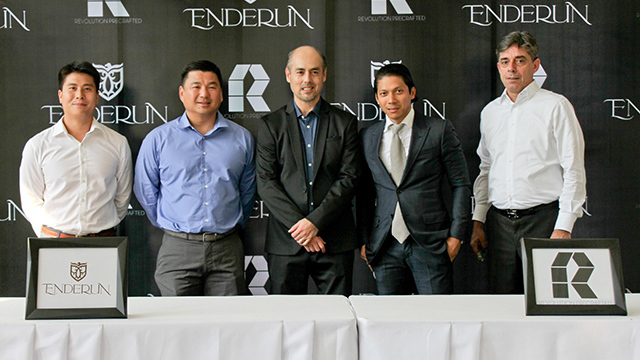 The Enderun co-founder himself chose the team that will guide entrepreneurs through every step of setting up the business—the design process, fit out and choice of equipment; operations systems and templates, menu design, cost control, inventory management; and advice on talent structure and financial systems. According to Revolution Pop’s website, a BLOX unit is made of “steel members, sandwich insulated panels, insulated roofing, hallow core steel doors, glass panels, moisture resistant boards for subflooring, and electrical and plumbing provisions.” These structures can withstand a “250-kph wind velocity and intensity seven magnitude earthquakes.” Supertyphoon Yolanda, the strongest cyclone to hit the Philippines in recent years, brought 10-minute sustained winds of 230 kph. The formation of the startup comes amid rapid growth in the local restaurant industry as food and beverage businesses (F&B) now occupy more spaces in shopping malls, according to real estate industry reports. Last August, Enderun Colleges started to offer a six-week restaurant entrepreneurship course in response demand from would-be restaurant owners. Related story: Are PH Shopping Malls Becoming Giant, Indoor Food Parks? For Revolution Precrafted, which has been successfully crafting premade designer homes, the entry into the restaurant business gives it a chance to broaden its scope. “With this partnership, we will enter into the dynamic F&B space, where relevance is key and design drives demand,” Revolution Precrafted’s Founder and CEO Robbie Antonio said in a statement. Dennis Uy Enderun Enderun Colleges entrepph Revolution Pop Revolution Precrafted Robbie Antonio Udenna Corp. Which Major Metro Manila Roads Will be Closed During the ASEAN Summit?